The fourth edition of Carlton's excellent Complete Encyclopedia of Cricket brings us up to date with the main events in the cricketing world. First published in 2006, the regularly updated versions ensure that readers always have the foremost and latest information at their finger tips. What is impressive about this book is that cricket through the ages and since the earliest days is not only recorded but covered in decent detail. Starting its journey in 1550 the book then traces the history through the decades and the first part, The History of Cricket, ends with the 2011 IPL. Domestic cricket is the theme of the second part and covers not just the Test playing nations but also Scotland, Ireland and some of the Associate nations in Europe, Asia and Africa before ending with the World Twenty20 in 2010. After each section on the Test playing countries, there is a good and succinct statistical survey of the winning teams. The Test Cricket section is cleverly presented in chronological order in a head-to-head section starting with the oldest rivalry between England and Australia and finishing with the most recent, Australia vs Bangladesh. Although some series are comparatively new and matches between the sides few, it is good to see every series covered and a resume of matches played with results for both home and away is included. The Cricket World Cup is the subject of Part 4 with all World Cups from 1975 to last year's included with a round-up of the event and a brief statistical summary highlighting Final Qualifying Tables and potted scores from the semi-finals and final. The Great Cricketers section mentions a vast array of cricketers through the years and are selected not necessarily for their statistical figures but for their personality, style and excitement which they generate. Some have a potted history, some of the great players have a much longer resume and all are accompanied by a resume of their first-class and Test careers. I was surprised to see Indian captain, M.S.Dhoni, not included within this list but nonetheless this section, like the whole book, is impressive. The last part is the Famous Grounds of the cricketing world from all Test playing nations. With maps detailing the locations of all grounds where international cricket has been played, this is an excellent end to a marvellous reference book. 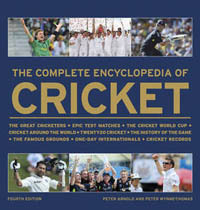 The Complete Encyclopedia of Cricket is lavishly illustrated with old and new photographs, black and white, rare and not so rare and, with its easy to read presentation, this is the ideal reference book.